Who is the BEST OF THE BEST in the Kennebec Journal circulation area? Vote for your favorite businesses! You could win a $50 gift certificate to one of the winning advertisers. It’s simple, just write in your favorite choice in each category on the ballot below and include the town. You do not need to vote for a business in every category, just include the ones you feel deserve this recognition. Deadline for entries is Friday, May 3, 2019. 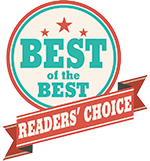 2018 Best of the Best Reader’s Choice Awards is presented by the Kennebec Journal, in conjunction with the Kennebec Valley Chamber of Commerce.